It's that mutinous, lil muse who whispers into the precocious child's ear and instructs him to rebel, take that other path, often at cost of a top letter grade or some such other, paradigmatic American accolade, which is the first spark and onset of an individuality required for the emergence of greatness, if not genius. Standing out, up and apart from the rank and filers that otherwise populate this benevolent, generous earth of ours brings with it an imperative to not only embrace being "different," but also using that differentness to send out universal flares in search of other different ones who speak in similar tongues. The inherent rule of Mankind mandates some productive outcome, something that assists survival and helps mark time and place for posterity. Man as the humanoid survivalist creature sadly gets in the way far too often and supplants those mandates with competitive brokerage in the form of income and power requisites that result in destructive vetting, leaving the virtuous, organic pursuit of legacy via one's deeds and works in the dust as agendas are chased at cost to self and others - and the recording of our of own history. 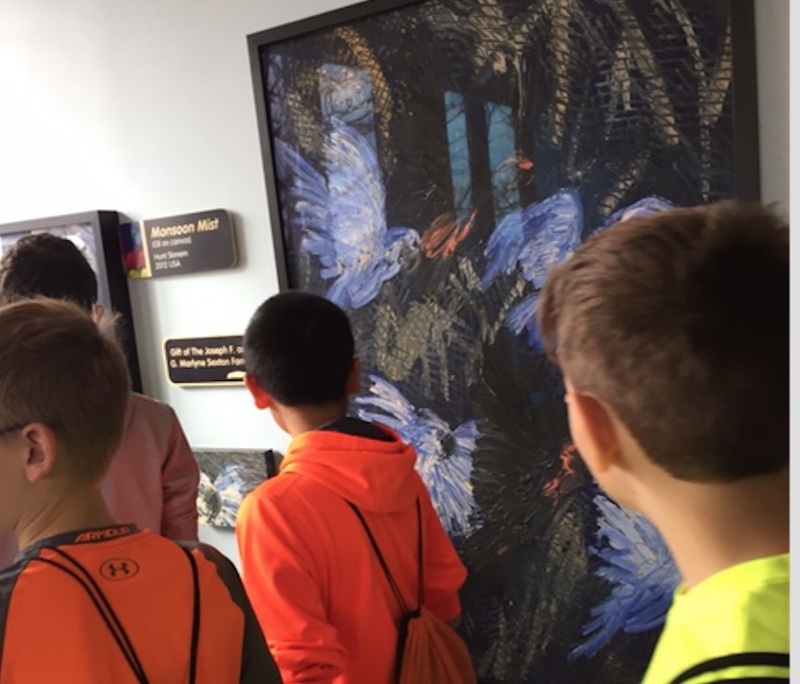 This past spring, I took my daughter and her 6th grade classmates on a tour of the Playscape at the Indianapolis Children's Museum, where a sizable collection of Hunt Slonem original paintings was acquired and is on partial display. The Playscape boasts a Bunny Wall and several larger works featuring tropical birds and creatures. While the Playscape is a tot-oriented, interactive exhibit, Hunt's scrumptious works are "no-touch" but all ages relevant. They are certainly high profile, as evidenced by the meteoric path Slonem has travelled as a top rung, globally celebrated and collected living artist. His original works grace national museums the world over and his licensed products, from high end upholstery fabric to designer knitwear, generate A-list celeb-caliber buzz. I can vouch for the addictive quality of Slonem paintings, having been completely taken in by them when happening upon an array at a local gallery two years ago (read on this in my HP article, Kindred Spirits: Hunt Slonem & Carmelo Blandino). While I applaud the Children's Museum savvy in their acquisition and good sense in creating an exhibit featuring Hunt's work, I wish the paintings were more accessible to all us "over-aged" kids, as the exhibit is strictly age monitored to give only the littlest museum goers and their chaperones unfettered access. If you do visit the museum, I encourage you to inquire beforehand for permission to view his works. Prior to the 6th grade fieldtrip and tour, I spoke at some length with Hunt over the phone. 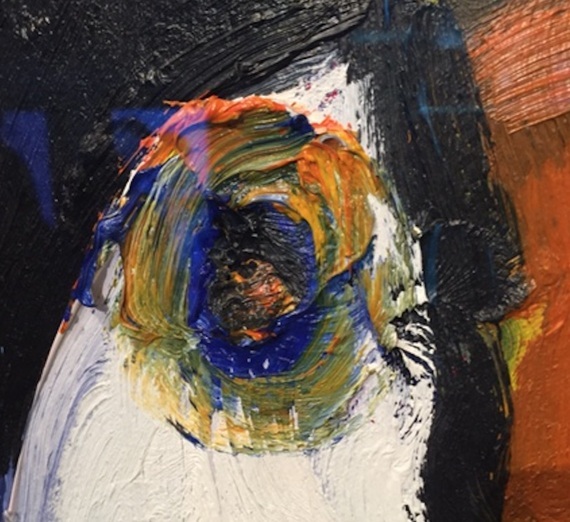 Soon after, I visited briefly with him in his Brooklyn studio, where, awe-struck like everyone else who steps into his gilded, rainbowed universe, I talked with Hunt amidst the cacophony of his winged menagerie, birds that clamored insistently for his attention. Not accustomed to the bird - um - song, shall we call it? - I had to lean in like a shelled-ear geriatric to make out Hunt's responses, for which he chastised me a little, having impinged on his hard-won, oh, so rare sense of space. I can only imagine the demand on this man, who loves and shuns in equal measure the unabated attention he garners (in particular his love/hate relationship with tech and social media), where fans clamor louder and ever more incessantly for his product and person.... Our phone call served me better, for the filter of voice-only connectivity allowed for that breathing room and a smidge more candor in the asking as well as the answering. I ventured to ask Hunt about his childhood, to think back to when he was, in 6th grade, or at least still in elementary school, and to tell me a little about his experiences, his memories of that time. Hunt talked about making art, lots of it, and at some point choosing to use deep pinks and oranges, and how he was scolded by what I will dub an anti-teacher for using those colors. What was he supposed to do, stick to cliché-relegated hues of "boyish" browns and blues? Hunt described this teacher in one word. As big boys can call a spade a spade with no eyebrows raised, an anti-teacher can be described with single-syllabic assessments "à la française." No repercussion, no latent sentencing, just conversation. But it left me wondering, what did the slamming shut of some proverbial classroom door open up in its stead? Is it incidents like this that cause one to look down a different hallway and turn the lock on the other, dogmatically regulated portal? If not inspired to look elsewhere, toxic building blocks can form and are gathered and stacked. Walls of passive disenfranchisement get built this way. At some point, those stacks of blocks come crashing down; angry impetus to negative action result. In Hunt's case, the possibility that confrontation with an anti-teacher sparked in him a fledgling expressionistic retaliation is clear. And what a great "So There" was the response; it may well have helped launch his eventual takeover of the contemporary art and pop cultural world. Robert Frost famously wrote on choice, that to take the other, less travelled road, "made all the difference." So There lies on that road. Thinking about those colors - why were the lush colors nixed? Did they invoke inklings of unconventional sensory mash-ups that to this day are debated and factionalizing? 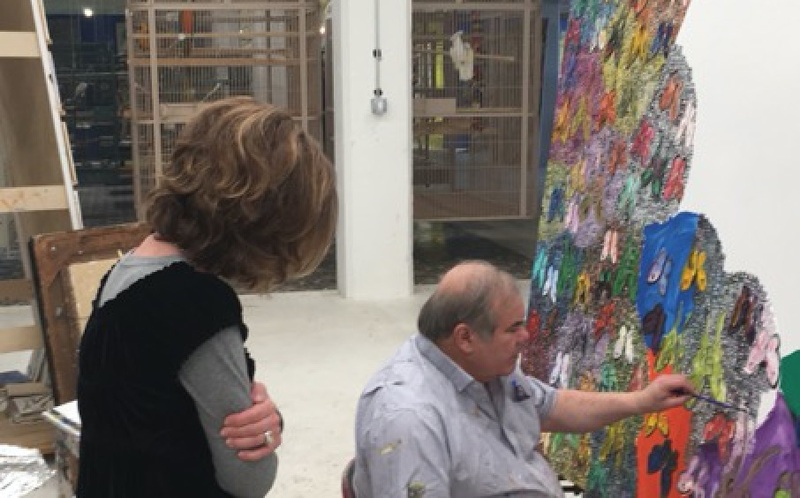 Mere color choices for art projects that threaten parameters of potentially narrower mindsets, which set one against the other, teacher against student, are nutshell examples of early inspirational shut down. The comforting blanket of censorship does make for an easier path - easier to control, easier to explain, easier to neatly categorize via American grading systems. But Art is the original Shock n Awe, and reactionary pushback has always been a first response (More on this in my HP article, In Support for Art as Extreme Conduit & Catharsis). Iconoclastic rioting, erasure via pedestal-placed perspective, has occurred at regular intervals in history, from whitewashed walls to painted fig leaves to burned books to rubble reduced monuments. It continues today. Fast forward just a little more to explicit language warning labels on recordings that actually spur sales and artists and performers who in one year are banned and branded, who in the next year host prime time holiday shows. Present an obstacle and whatever is on the other side appears at once more enticing, thanks to the balancing force that is our innate curiosity. What opened Pandora's box, took the apple, and took us to the moon and back, is the weft thread in our human fabric - and Art is its loveliest descendant. Serving in so many ways, Art challenges society. The road Hunt chose, pivotal for many like him, opens doors for the rest of us. We witness, wonder, learn from it and grow with it as well. That road, that first burst of creative courage carried forward to Hunt Slonem's here and now, helped mold a past-invoking, subconscious guide in the adult artist. The tremendously wry bunny motifs that have become his signature rely on obvious duality, as they are both cute, warm n fuzzy and compulsively reproductive critters. Humor, our most healing Art, is evidenced. I relish imagining that Hunt is fabulously and famously overriding what some anti-teacher may once have tried to stifle. Relatable motifs, from pop-culture portraiture to tropical floral and fauna, rendered in brushwork and palette knife cross-hatches that invokes frosted cake scrumptiousness, Hunt's Muse whispers with the loveliest of So There's. So There is also in his gift of gab - easy eloquence paired with driest wit - which holds musuem patrons and moneyed socialites equally enthralled. So There is happily here in Indiana, and it's all the way out there, at the Hermitage Museum and in opulent galleries as far as Dubai, with sold out shows and highest honors duly awarded, the first American artist since Andy Warhol to accomplish cultural crossover at this level. Hunt went on to mention how glad he was to be an adult, how much he preferred to be that over the child he once was.... The stature of accrued years affords him, clearly, the unmitigated permission he needs to give himself to do just exactly as he pleases, when and how and with whom he wants to do it, and to be as entertaining and cantankerous as he wishes to be. Indeed, Hunt is free to challenge his compatriots with the freedom of a Peter Pan, post pirate ship takeover, a Captain Pan.... The crux being, of course, that Hunt lives, works and renders with the barely filtered exuberance of a child. It's in his critters, the living ones that fill a city of cages in his warehouse studio and perch on his shoulder like pirate familiars and in the rendered ones, brought to life by a spontaneous and emotive hand. Hunt goes so far as to sprinkle some them like Peeps (What are Peeps? he once asked me), not with sugar, but diamonds, which is so kitchy, it's sublime. The wonderlands that are his palatial workplace and gilded, trinketed residences are his playgrounds - fantastical imaginations of home n hearth. Why, that unfiltered exuberance is even evidenced in his personal style - ultramarine brocade jackets in jewel tones. No pajamas. There is nothing pastel or passé about Hunt Slonem in looks, words or works. He has figured out how to sign - with a flourish - his own hall pass. So There. To follow up my conversations with Hunt, I spoke with Charity Counts, formerly of the Indianapolis Children's Museum, who filled me in on the intellectual impetus behind the Playscape. 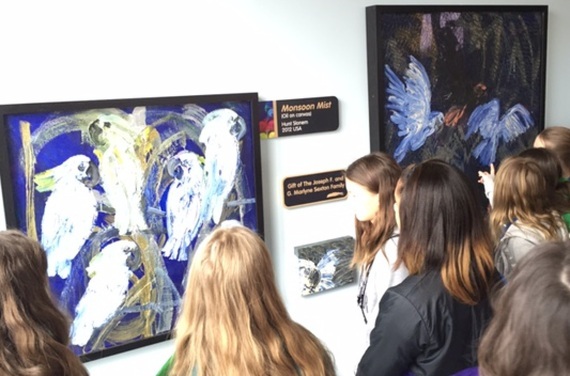 The basis of the ICM exhibit is a school of thought named for its place of origin, Reggio Emilio. The moment I began to read on the Reggio Emilian approach, I recalled the public school kindergarten year of my youngest child, where by happy coincidence the school system had also adapted the progressive and intuitive philosophy. I am on record as having always touted what a great year it was for my daughter. She learned and played in an environment where, as it turns out, everything from room design to free-form literary expressiveness was founded on Reggio Emilia. It so happens that soon after the school year began my daughter had an accident at recess. The front wheel of the tricycle she was riding twisted, and she was pulled to the ground with it, her right arm entangled in the bike, resulting in what is called a Monteggia fracture. Trauma this graphic and painful, visited upon a child, her classmates and her teacher, who gathered my injured girl up into her arms, takes some getting over. But children are our starfish, the jovial pediatric orthopedic surgeon later explained. They don't just heal; their growing bodies and limbs possess the capacity to re-align themselves with corrective, reconstructive powers. Within days, our daughter was back at school - and back on a trike. The Reggio Emilia approach the school had adapted allowed for the children to devise their own play therapy. The day she went back to school, her heavy cast supported by a sling, the children made slings of scarves and wore them in solidarity. Together, they re-wrote the event by transforming, however macabre the play might have appeared, the classroom playhouse corner into a clinic: Dining tables became surgery stations, dolls and stuffed animals were patients; the kids were the docs, nurses and victims, interchangeably. As it is in life, so it is in play: Roles change on a dime. Injuries were re-enacted and re-imagined and played through to healing conclusions. Contrast this experience with any year spent enduring the uninspired teachings of the few who choose education for its convenient vacation alignment or with disproportionate authority ideations, or in cash-strapped school systems where depleted and overworked or over-tenured human guideposts, however passionate in their calling, aren't equipped to mold our children. Consider too the children, from EZ Appeasement hatchlings stuck at the centers of their little universes to those on the other end of the attention spectrum, children with absent or absent-minded, tech (or other)-addicted fathers and mothers, who are defaulted to familial sidelines. Burdened with academic and/or personal frustrations and further with the role of ersatz parent, educators juggle with the ills of the outside world in classrooms comprised of needful youngsters. Unions and federal funding games, through sheer size and politicization, further skew the process of education away from its purest purpose, as does the unfortunate free market measure of under-payment of our teachers, which precludes competition by those best suited for the job. Creativity as walking hand in hand with Arts education, having been viewed for some time in the US as a dispensable element, continues to gain foothold in our schools thanks to important, newer legislation that places the Arts in with core curricula (ESSA Act of 2015). Creative expression remains, however, a quick candidate for anti-teaching moments of behavioral control: As Hunt the child experienced it and rose up, out and beyond, as I also remember when as a child I refused to conform my cursive hand-writing to the mandated formulary style at the cost of several letter grades which I accepted in protest. And I think back on my second son, who as a second grader struggled with an educator, close to retirement age, who peppered her teaching with adult snark, and how it affected him for years. "Mommy," my seven year old asked me once, "what does it mean to 'get a brain'?" Memories of unfortunate classroom experiences abound, where an activity or behavior fundamentally not wrong was seen as such. What we do with those experiences, how we overcome them, is up to each one of us, as guided by the varying capacities we are equipped with - with vastly differing degrees of success. The New York Times article, "The Remarkable Shelf Life of the Offhand Comment," by Henry Alford, shed recent light on the Stick n Stones fallacy of off-hand comments and their very real, very toxic half-lives. Words are weapons, used and abused in equal measure. Once tossed into the ether of memory, hurtful comments can take diverse routes - down depressive spirals of self-punishment or as a lifelong impetus to override what was once said, why and by whom. That "So There" manifestation. It is why our educators remain essential to the creation of our social fabric, for their words rank equal in impact with anything a parent might ever say, potentially as verbal milestones. It is why the words and work of a good teacher is modern society's best gift to itself. •	May our museums continue to blur the lines between art and artifacts and may they continue to support artists who are accessible and integral to popular culture, for it catapults age-old entities into current centuries and helps make the loftiest treasures more accessible to everyone. •	May we pay our teachers well so that the best of the best compete for their jobs; this might be the most noble free market application of all. •	It is then for Hunt and his edge-pushing, creative compatriots, with the eyes and ears of the consuming populace upon them, to champion the Arts as a vital retaliatory strike against any less evolved status quo. They manifest by their life paths chosen and subsequent work as the truest of teachers - those who lead by example - and help provide the antidote to the anti-teacher that exists in all of us.